Today, I made one of my patients very happy by extracting one of these little ‘friends’ (the name I give to innocuous skin acquisitions as opposed to their more sinister counterparts, the ‘foes’). She had the unsightly bump for more than 2 years and it took precisely 2 seconds to remove it with the help of a teensy yellow needle, a couple of cotton buds and some magnification. So satisfying. Now, these develop most commonly around the eye and are essentially tiny cysts, formed from the lining of the hair follicle. This basically means its a tiny ball made up of a layer of skin cells folded back in on themselves, under the skin. And dead skin cells accumulate within the ball because they have nowhere to go, giving them their characteristic, pearly white colour. 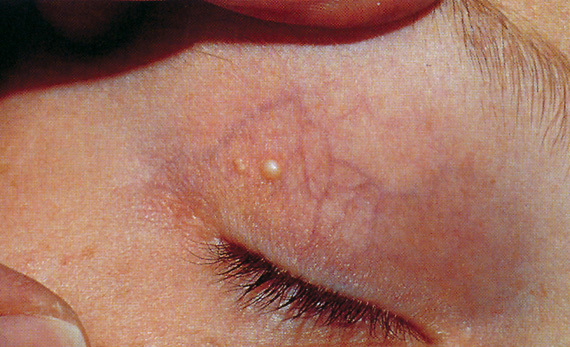 They are often mistaken for whiteheaded spots (called pustules) or closed comedones-but when squeezed, nothing happens. Why they form isn’t fully understood, but comedogenic (or clogging) skincare formulations and sun damage are likely to be contributory. Using topical steroids can also predispose to them, so they are sometimes seen in eczema sufferers. They are also very common in new-born babies, in whom they tend to resolve spontaneously. Unfortunately, this tends not to be the case in adults. So what to do to prevent them? In truth, not an awful lot works. I advocate the use of non-comedogenic skincare as a general rule, and I think this is a good beginning if you’re prone to milia. Topical retinoids are beneficial in some patients and certainly make them easier to extract. Over-the counter products containing retinol or retinaldehyde are good alternatives to prescription products, but always introduce this group of ‘actives’ gradually when using them in the delicate eye area.And of course, this step necessitates the use of a broad-spectrum sunscreen, which again should be non-comedogenic (loving Vichy Mattifying Face Fluid Dry Touch SF 50 right now). If you have milia,you can choose to a) do nothing-they’re harmless. Or b) have them extracted. The commonest method is with a sterile needle followed by manual extraction. A good way to make your dermatologist’s day.